Fed up with a wardrobe stuffed full of clothes that don’t fit or you just don’t fancy wearing any more? Too busy paying for childcare and Baby Boden to buy anything for yourself? You need the first MGF Clothes Swap Party. It’s simple – just bring a handful of good condition clothing that you no longer wear and swap it for lovely stuff that you will look marvellous in. Not only that, but we have a prosecco bar, tea, soft drinks, mulled wine and cake from the lovely Truly Splendid Tearooms, massages and beauty treatments to book and enjoy. Please do come and support us – we’d love to see you there. It promises to be a very fun night. 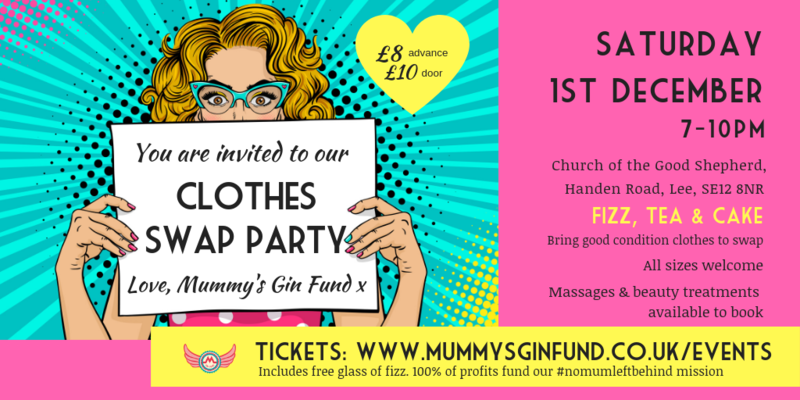 Prosecco, massages and free clothes – what’s not to love! Grab your tickets now! All profits will be used to fund our #nomumleftbehind mission. Huge thank you to all the volunteers involved for their support.